Download this guide in full with pictures (47KB). In the motorcycle engine, the stud is screwed into the crankcase components during manufacture and it is seldom necessary to replace it. However, over time the threads can become damaged or the rod bends. Sometimes it helps the dismantling process if one or more studs are removed. Stud removal is an easy process explained below. The reason it is necessary to dismantle is to allow you access to fit 2 (two) nuts to the threads on the stud. Sometimes this can be done without dismantling for example with carb studs but on cylinder heads the cooling fins get in the way for the next process. With carb studs they are not usually long enough to allow the fitting of 2 nuts unless you can use thinner nuts. (Thin “Half” nuts are available). You need to lock the nuts against each other and onto the stud. I do this by hand at first using my fingers to place the 2 nuts fully onto the stud, then turn the lower nut clockwise and the top nut anticlockwise until they are tight against each other. I then use two spanners to complete the tightening process. You have now made the stud into a bolt. Then using one spanner turn the top nut anticlockwise and the stud should start to turn and unscrew from the crankcase. If you did not lock the nuts together hard enough the top nut will simply unscrew and you will have to repeat the locking process and try again. Remove the stud. Take the replacement stud repeat the process of locking on the 2 nuts and then screw it into place. I avoid using Loctite type products! Unlock the nuts from each other by reversing the locking process and you stud is ready for use. 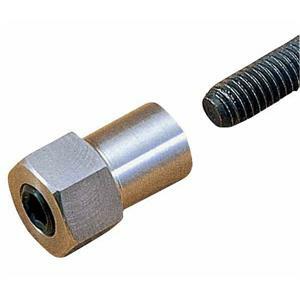 Sometimes the nut has rusted to the stud and the normal process of removing the nut will turn the stud and allow its removal. Broken studs: If the break leaves sufficient stud to be gripped by a tool like a molegrip then clamp on and unscrew. If however the stud breaks close to the crankcase you have 2 options – take the part to a professional or have a go yourself. When a camshaft holder bolt sheared on the cylinder head of my Suzuki I opted to remove the head and have the broken piece removed from it by an engineering firm as the risk of damage to an expensive component was high. To remove a broken stud or bolt you need a quality drill bit, drill and a stud remover of the appropriate size. You drill STRAIGHT down the centre of the broken stud but NOT into the component it is fitted to. Before starting you have had to flatten the broken end and punch mark the centre. The stud remover is like a tap tool but it threads in anticlockwise so as you tighten the remover the remainder of the stud releases. It is easy to go off centre when drilling or to break the stud remover and then you do have problems as they are hardened metal! Engineers have an alternative process called spark erosion that can effectively burn out the broken piece. You now know how to fix your studs. P.S. replace studs with studs NOT fully threaded bar. Note: JAWA CZ studs should not be used for the belly button, nose etc!